When carrying out work involving traffic, safety is our priority. We are concerned for the safety of both our own staff and the public at large. It is also important to manage the disruption of the normal flow of traffic on public roads to minimise the effect on road users. 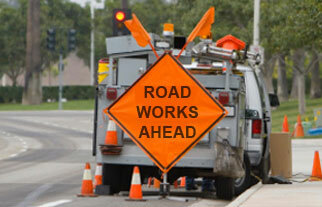 Before any work begins, we complete a Traffic Management Plan. Only those qualified under the CSCS (Construction Skills Certification Scheme), “Signing, lighting and guarding at roadworks course” can complete this detailed plan. The Traffic Management Plan details the layout of the road and the layout of the roadwork signs. A Safe System of Work Plan (SSWP) contains a detailed account of the equipment needed, so that everything is in place before the work commences. A Site Specific Method Statement is also completed. This concerns the work required and how it is to be carried out, taking into account the specific issues unique to each project. We are proud of our consistent level of traffic management which is evident on all our projects. We are committed to the health & safety of our employees and the general public.